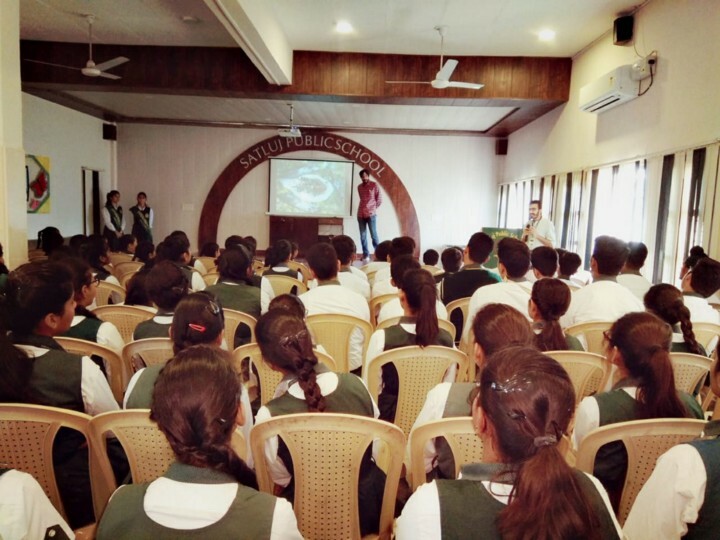 Earthr.org addressed about 100 students, from grades 5 to 11 of Satluj Public School, Panchkula. In a highly interactive session with the curious students who’re holding various leadership positions in the school, we spoke about the meaning of sustainability, the need for it, the urgency of the situation, and how we can make changes in our lifestyles to create an impact. The students viewed photographs of the threats to oceans and marine life due to our tremendous consumption and dumping of plastic and other disposables, of how huge amounts of perfectly good food is thrown away while 13 per cent of the population stays undernourished, of the cruelty and impact of animal agriculture, and of the destruction of precious forest ecosystems. Students are quick learners and have the energies and ambitions to start at once. They chipped in the discussion, asked questions, suggested alternatives and reasoned for such human behaviour. The role of teachers, facilitators and the management cannot be overstated in driving positive change on a large scale. Teachings at a young age stay long and with the right tools, children could be the right agents of change. Sessions like these can be considered as precautions taken on time rather than trying to fix what has already broken. Earthr. org also signed an MoU with Satluj Public School to collaborate on creating policies, frameworks and curricula, and promote sustainability entrepreneurship within the organisation.